– Mix the dried yeast into the tepid water and set aside to start to bubble. – Mix together the flour and salt in a bowl. Make a well in the centre. – Pour the wet ingredients into the well and stir to form a dough. – Knead well (at least 10 minutes) until the dough is smooth and doesn’t easily tear. – Place back in the bowl, covered with a damp cloth and leave to prove until doubled in size (at least an hour). – Knock back the dough. Cut into four and roll each into a smooth ball. – Press each ball out with fingertips to form a thin circle. Re-press out each disc a couple of times. They should look like thick, dimpled pizza bases. – Drizzle the top of each disc with oil and press into the dimples. 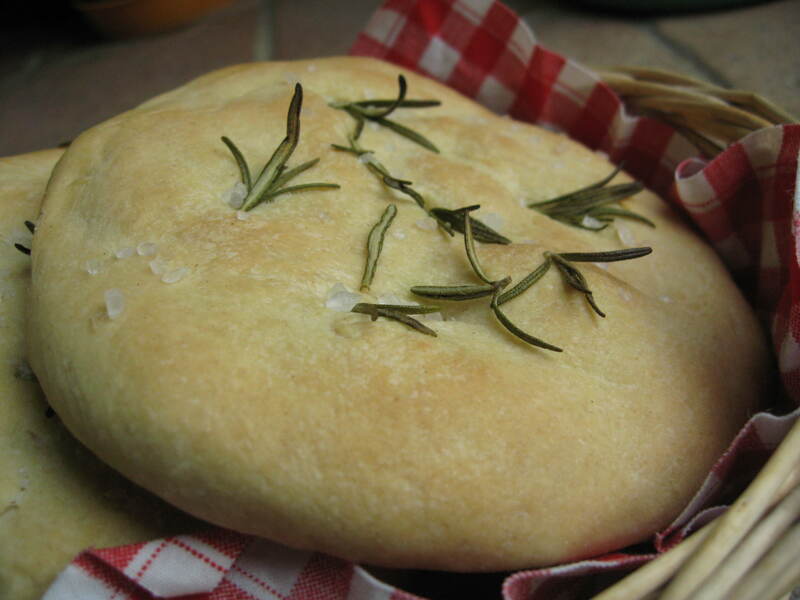 – Press rosemary sprigs into the dimples and sprinkle with coarse rock salt. – Place on a baking sheet lined with parchment. Cover with the damp cloth and leave to rise for half an hour. – Uncover and bake in the oven for 20 minutes, until lightly golden. We used to serve a similar bread in our restaurant with olive olive oil/basalmic vinegar and garlic cloves. Everybody loved it. This looks great!